Members of the public are welcome to attend this public meeting. The function of a JPC is to serve as a forum for consultations, discussions and recommendations on matters affecting the policing of the local authority’s administrative area. Members of the public have the right to make their views known and ask questions. 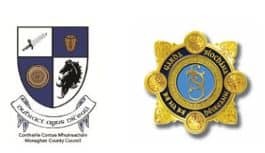 Senior members of An Garda Síochána will be present on the evening to answer questions. To facilitate the preparation of a full response to questions raised by members of the public, all questions are to be submitted in advance of the public meetings. Questions can be taken at the meetings but full information may not be available. Questions can be forwarded in writing in advance to Mary McGarvey, Senior Staff Officer, Corporate Services, Monaghan County Council, The Glen Road, Monaghan or by email to mmgarvey@monaghancoco.ie. Alternatively you can call 047-73749. Questions will be accepted from any person affected by the policing of the area. All questions should be received no later than Wednesday, 23 January 2019 and must be accompanied by a name, address and contact numbers. These details will remain confidential. Please note that the Joint Policing Committee may not consider matters relating to specific criminal investigation or prosecution or matters relating to the security of the State.